ContactsLaw gives you all the tools you need to effectively manage your staff (we call them “members”). Electronic signatures – Save your practice time and paper by signing documents electronically. Admission, certification and CPD details – Track the advancement and professional development of your practicing members. Supervisor(s) and subordinate staff – Manage the chain of responsibility within your firm. ContactsLaw offers both broad and granular control over member permissions. By creating security groups, you can assign blanket permissions based on seniority and responsibility. You can then restrict access to certain activities (and even individual steps in a workflow), dictate the amounts members are authorised to spend or write off, and grant access to management features. You can even establish confidential files and obfuscate the names of sensitive documents. Most importantly, you can ensure that every member has access to the features of ContactsLaw they require, without having to grant broader permissions. Why purchase an expensive, third-party payroll system when ContactsLaw provides everything a small-to-medium-sized law firm needs to pay its staff, manage leave and superannuation, and keep PAYG records? ContactsLaw simplifies and streamlines payroll activities, empowering partners and practice managers to do the work themselves, eliminating the need for a dedicated pay clerk. With payslips and superannuation information available electronically, on-demand, ContactsLaw promotes transparency among your staff; removing stigmas and resolving disputes. Key performance indicators – See the most important metrics at-a-glance, at a snapshot in time or for the year-to-date. Assign a target to each KPI figure and track your progress towards your goals. Sales – Evaluate your billing performance and ensure that you are always billing more time than you record. Time – Track your members’ progress towards their time recording targets and keep the level of WIP in check. Marketing – View the results of your marketing efforts in terms of prospects, new files and the projected value of new business. Recovery – Ensure that you are recovering what you bill, and within a suitable timeframe. Debtors – Monitor your debtor balance and identify the need for recovery action. Bad debts – Investigate the cause of bad debts and improve your recovery statistics. File lists keep you up-to-date with the state of the matters you manage or supervise, determining when to bill and indicating when management action must be taken. Throughout the day, you can watch your staff generating billable hours as they record activities. ContactsLaw divides your practice into workgroups, each representing a particular area of law in which you specialise. More than simply a logical division, you can assign authority and permission to specific members within each workgroup. This gives your workgroup managers the power to effectively manage their respective areas of law, and allows them to be ultimately responsible for their management. All of this is possible without undermining permissions for partners/directors. By capturing every contact you do business with (including third parties), you build a rich and intelligent base for marketing. Your reward for completeness of information is to be able to target particular industry groups, geographical locations, prospective workgroups and on many other criteria. Dynamically-built contact lists and mass mail-outs help you generate new and repeat business. Referrals allow you to determine the most effective ways to advertise your services, and to identify clients who generate business by word-of-mouth. By drawing on information from current and past matters, ContactsLaw facilitates a richer interaction with existing clients. Easy access to historical information enhances knowledge and creates a personal touch, while also identifying potential problems. ContactsLaw recognises that document production is the mainstay of a law firm, and that automation is the key to efficiency and consistent quality. To meet this objective, ContactsLaw offers two dynamic mechanisms; document types (to define the semantics and behaviour of each distinct type of document) and document templates (to define how data from ContactsLaw is combined with static text to produce a complete document). Draw upon any piece of information from relevant contacts, files, related documents, workgroup fields, members of the firm and the practice itself. Combine fields to produce tables and construct sentences dynamically. Use rules to show, hide or apply formatting to data as it leaves ContactsLaw. 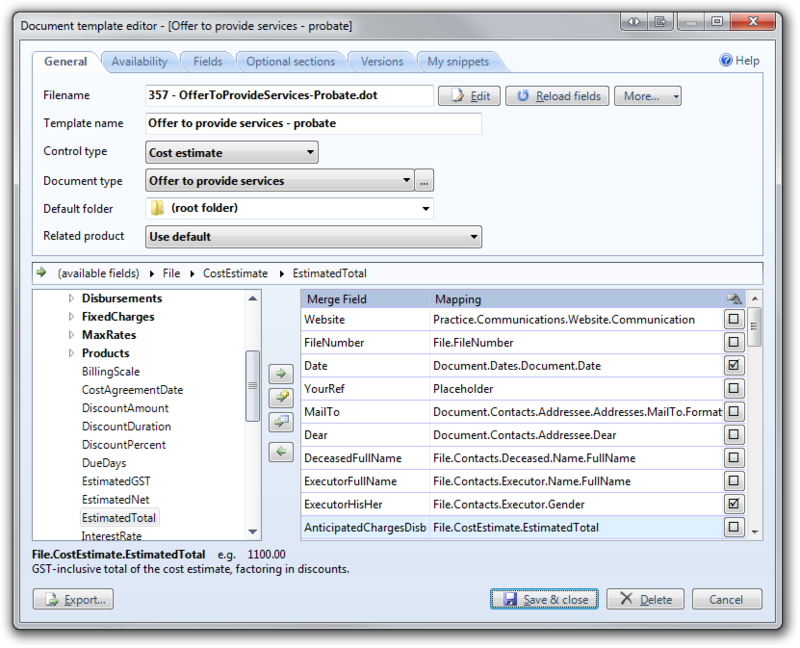 Create special templates for cost agreements, bills of costs and other ContactsLaw features. Best of all, no technical expertise is needed to build templates in ContactsLaw. With its intuitive editor and integration with Microsoft Office, all you need are basic word processing skills and an understanding of how ContactsLaw structures its information. The result is less time spent manually authoring documents, and less guesswork on the part of your team. Document production can truly be managed from a top-down approach, in which all staff can benefit from the collective experience of the firm. 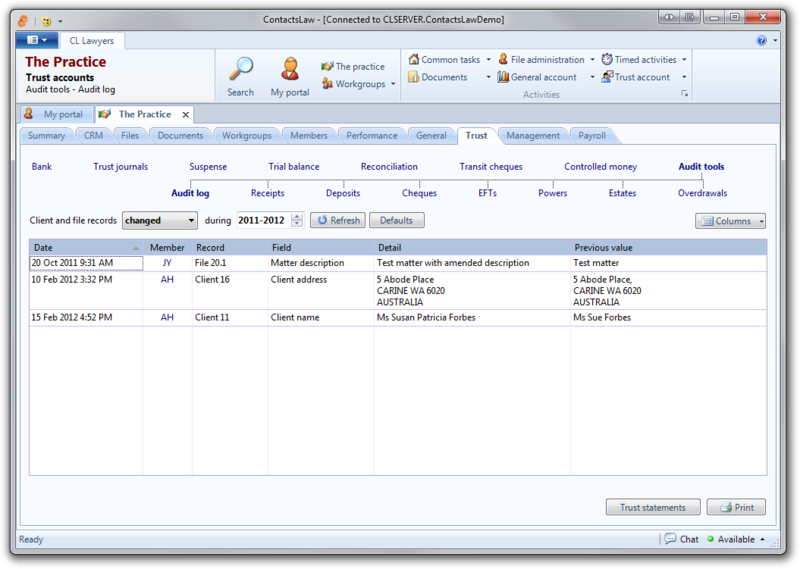 With ContactsLaw, there’s no need to run a separate accounting package to meet your general ledger and banking needs. All transactions, reports and accounting activities are fully-integrated with contacts, files and documents; strengthening integrity and reducing manual data entry. Flexible workflows model the way your firm handles receipting, payment requests, disbursements, creditor invoices and banking; breaking each activity into discrete steps and directing them to the relevant people at the right time. ContactsLaw manages your entire chart of accounts, including support for multiple bank and credit card accounts. All GST is captured and comprehensively reported, with built-in support for completing your BAS. Reconciliations verify the integrity of your transactions and safeguard against change. Rollover and adjustment journals simplify your end-of-financial-year bookkeeping. Profit & loss, balance sheet and trial balance reports provide you with a clear picture of your financial position. Furthermore, ContactsLaw’s billing features integrate fully with your general ledger; whenever you record a disbursement or finalise a bill, all related transactions are posted automatically. 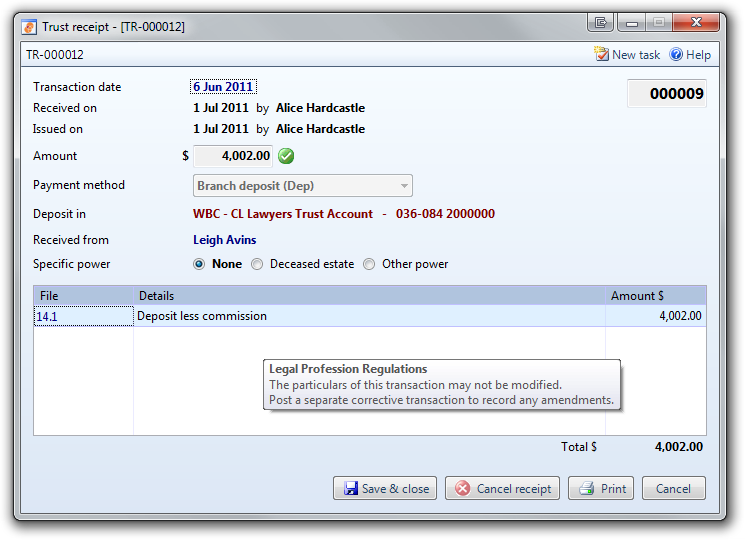 ContactsLaw makes it easy to operate a trust account and comply with regulatory requirements. In addition to being fully integrated with contacts, files, documents and workflows, all trust accounting features in ContactsLaw adhere to the 2009 WA Legal Profession Regulations and the 2005 NSW Legal Profession Regulations. Each trust accounting activity is designed around the relevant record-keeping and conduct requirements, which are enforced through intelligent business rule modelling, workflows, permissions and auditing mechanisms. You can record receipts, payments, journal entries and bank deposits, safe in the knowledge that the information is complete, correct and safeguarded from change. ContactsLaw also provides specialised activities for ordering bank cheques and transferring funds from trust to general (simultaneously updating your general account). Reconciliations enable you to verify and demonstrate the integrity of your records. The trial balance identifies all matters for which trust funds are held. A comprehensive set of reports are available on-demand, to help you manage, monitor and audit your trust account; including all reports required under legal profession regulations. ContactsLaw includes wizards to automate the process of issuing trust statements to your clients, either periodically, on closure or upon request. Special provisions are made for handling transit cheques and controlled money, as well as reporting powers and estates. ContactsLaw is highly customisable, and changes to suit the needs of your practice; not the other way around. Practice-level policies dictate the behaviour of the system, as well as providing appropriate defaults for more fine-grained management. By taking the time to configure the system, you’ll save yourself (and your staff) time and money. Set policies for accounting, payroll and billing to take the guesswork out of using the system; members can rest assured that the defaults reflect practice policy. Establish payment authority levels to avoid having to get involved with trivial transactions; you can authorise subordinate members to spend below a certain threshold, and even establish a complete hierarchy of authority. Configure workflows, create specialised activities and re-organise the ribbon to mirror the way you do business; you can ensure that only relevant are available to staff, and that each of those activities accurately models the real-world processes behind it. Define fixed charges and disbursement types to clearly dictate your firm’s billing policies; there’s no need to maintain separate office manuals – fee-earners can select from a list of allowable charges and be confident that they are billing at the current rate. Decide which contact details are most important to capture for your practice; strike a balance between the information which is mandated and the time it takes to create contacts and files. ContactsLaw doesn’t just help you manage client files; you can create administration workgroups to house files for managing employee records, banking, creditors, tax and other internal matters. Admin files offer all the functionality of client files; you can store and generate documents, record activities, model important contacts and more. However, they can be excluded from time recording (or record zero charges) and are grouped separately in billing and performance reports. For confidential matters, you can restrict access using permissions, obfuscate the names of documents or completely lock down the workgroup. At the practice management level, you can preuse a list of your active admin files. Quickly build cost estimates – You simply build a list of likely services required. Give your clients certainty – By fixing the price, clients avoid nasty surprises when the bill is rendered. Make it possible to bill upfront – Since you are not relying on time records, you can collect monies in advance, eliminating the risk of recording a bad debt. Bill more than you record – If less time is recorded than the agreed price, you profit from your efficiency; in stark contrast from time costing, which rewards inefficiency. More easily produce a bill of costs – You can design legal products which mirror the items on a statutory scale; when you have to produce a bill of costs, you already know how time was allocated on the matter. Define products for each workgroup that represent the services you offer and how you charge for them; you can fix the price, impose a maximum cap or bill according to time. Maintain separate charge policies for products where a statutory scale applies. Build cost estimates and render upfront bills when you open files. Allocate time and charges to the relevant products as they are recorded; or at any point prior to billing. 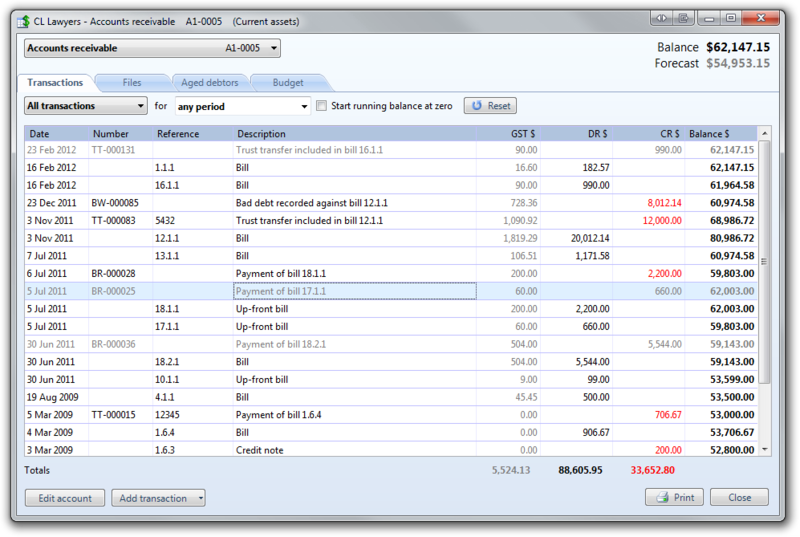 Compose bills effortlessly, with the ability to bill products selectively or include additional products. View performance reports to periodically evaluate and adjust the pricing of your services.